Mundane Bergamot is just a simple Kitchen Witch from Whistlestoppe Village who thinks that there is more to life than gardening and cooking up spells with her Aunt Dovie. While traveling to Bettelburghal she meets Javen, a mysterious Book Mage from Nettlespire, who gifts to her a most unusual magic book which triggers a visit from two very extraordinary adventurers. She learns from her new-found friends that they need her help to save them and their kind from a terrible fate. Through Javen’s gift, clues begin to reveal themselves that sets them on their quest. But the evil King Vezzen of New Taleggia has plans of his own for the elusive creatures that inhabit the mountains beyond Dovewood Forest. Where previous kings have failed, King Vezzen is determined to succeed and impatient for a new war that could elevate his name above all others. Now Mundane must see if she has what it takes to out-smart the wicked king, save her friends from the brink of extinction, and quite possibly lift the curse that binds them all to Dovewood Island. The Hobgoblin Queen starts off in the village of Whistlestoppe. Whistlestoppe is a village of Kitchen Witches and the village is getting ready to celebrate Yule. They celebrated with a feast and with a bonfire in which they burn a large timber bird and call out to the four corners (North, South, East, and West). After the bird is totally consumed by flames, the party begins. At this party, Mundane Bergamot is sitting with her best friend, Absidee Valerian, and Absidee’s baby sister, Lottie. They are taking in the Yule feast and talking about crushes (mainly Absidee’s crush, Brason Vervain) and Mundane’s upcoming trip to the town of Bettelburghal to help her aunt’s friends sell their wares. Mundane feels that there is something missing from her life and she can’t figure out what. While she loves Whistlestoppe, she is restless, wants to travel and gets her chance when Henley and Gittel Lovage goes to Bettelburghal. She would never move away from home. Her Aunt Dovie, who has raised her since she was 8, lives there plus all of her friends. Her mother died giving birth to her and her father, well he died in a horrible accident at sea when Mundane was 8. Everything she knows and loves is in Whistlestoppe and she could never leave for good. The next day, she is getting ready to travel with the Lovages when Aunt Dovie gives her a beautiful green cloak for Yule. After saying goodbye to Aunt Dovie and traveling a little while, the Lovages decide to take a break and then take a different path to Bettelburghal. The path that they are going to take takes them to The Crossway (where all the roads to all the different areas meet), where Javen the Book Mage lives. Javen is one of the few survivors of a war in the Book Mages ranks that happened at Nettlespire (where they lived). That war almost wiped them out. Mundane is excited because she is finally going finally meet a Book Mage. By the time they reach The Crossway, it is night and Javen is waiting for them. As Mundane is admiring Javen’s books, he gifts her with a book. A blue, leather-bound book with the letter B on the cover. She doesn’t get to read right away. She fell asleep the first night, traveled through a snowstorm and then was helping the Lovages unload their cart. She does notice the chickens at the stable and thinks that it is odd for them to be outside in a snowstorm. It was after a bath and her musing about how the seas around Dovewood were not allowing the residents to cross, that she opened the book. And oh, boy, she was in for a surprise. The book was full of blank pages that all of a sudden started to fill. A map of Dovewood appeared with all the cities drawn in extreme detail. Mundane is surprised to see that her treehouse is prominently featured, along with other features in other cities. On the map itself, there are X’s and arrows but no words. After taking her fill of the map, she turns the page and a riddle appears on the next page. To what, Mundane has no clue but she does know one thing…..she has a Goblin book. Goblins are creatures of myth in Dovewood and no one in recent years have seen one. The next day, Mundane puts in a morning work but she notices that the chickens from last night are seeming to follow her. Telling Gittel that she is tired, Mundane goes to her room to nap. As she approaches her room, the same two chickens run into her room and morph into two small men. They introduce themselves as Fickle and Frazzle, hobgoblins. After getting over her shock of seeing hobgoblins up close, Mundane shows them the magic book that Javen gave her and they show something big. She is chosen to find the gems that were scattered by two brave hobgoblins, Guile and Grouse, put them in a necklace called the Simulacrum and save the hobgoblins who were turned into Trow by their anger over being hunted by King Vezzen, the King of the Taleggians. The magic book that Javen gave Mundane was written for her and could be only for her. It is a lot for Mundane to take in and she asks until before she leaves town to make up her mind if she is going to help them or not. While Mundane is being told all of this, King Vezzen is on an obsessive hunt to exterminate all hobgoblins and find their city. He believes that destroying the hobgoblins will lift the curse that keeps the island isolated and he also wants what he thinks are treasures that are in their mountains. He has become all consumed by his obsession….to the point where he is ignoring his son, Prince Stelvin, and his wife, Queen Sora. He also has a secret in the dungeon of his castle. A big secret that could be the undoing of the hobgoblins. He also has enlisted the help of the only other Book Mage alive. That Book Mage is Lorcan, Javen’s brother. Mundane does make up her mind and decides to help the hobgoblins after reading a letter from her long-dead father. Her father was instrumental in making the Simulacrum and the gems that go with it. After she arrives home, she discovers that her Aunt Dovie is part of this plot to help the hobgoblins. Dovie sheds even more light on the hobgoblin saga. They come up with a plan to send Mundane out-of-town on a supposed apprenticeship. That way, her going missing wouldn’t raise the suspicion of a mysterious spy in their midst. With those plans set in place, Mundane is off on her grand and dangerous adventure. Meanwhile, King Vezzen is getting more bloodthirsty and more obsessed with having the greatest power over Dovewood. Will Mundane be able to gather all the gems in time? Or will King Vezzen succeed in getting what he wants? I wasn’t expecting to like this book as much as I did. From the names (Absidee gave me a big laugh) to the people to the adventure, it sucked me in. I couldn’t read enough of it. I also love that I can be very comfortable with my 11-year-old reading it!! I really felt a connection with Mundane. I loved how she looked for the positive in everything….even when she falls out of towers…lol. Her commitment to the hobgoblins was impressive and touching. I also connected to Fickle and Frazzle. They were fighting for their people’s lives and they were willing to follow Mundane on her quest and help her with it. Plus they could shapeshift into anything (mice, chickens, and cats were portrayed). I am still on the fence about Javen. While he is coming across as a good guy in this book, I really have my doubts about how good he is and what his agenda is. The end of the book does end in a cliffhanger and it made me crazy. I really wanted some closure on certain storylines. Guess I will have to read book 2 to find out what happens. Why: This was a fantasy book that took me back to when I started reading fantasy. It has everything. 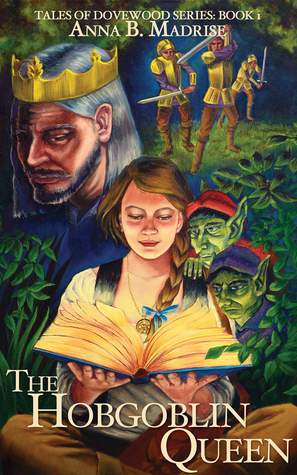 An engaging storyline, well-rounded characters and an evil King who was truly very evil. I also love that I can have my 11-year-old daughter read this book because it is age appropriate.